wahaj27 gave this 5 stars! 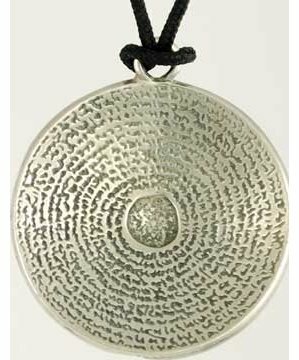 The spiraling text in this amulet serves to trap and confuse evil influences which may come your way. It is about 1 inch in diameter and comes with a black cord so that it may be worn as a necklace. Rated 5 out of 5 from 2 reviews. I don't have this particular talisman, but intuitively speaking, this is another must have, for various endeavors. This very design can be incorporated into binding bowls that you place underneath your house to prevent evil forces from entering. The thing is, when a spirit enters your domain, they circle the room three times, counterclockwise. Very great talisman design.